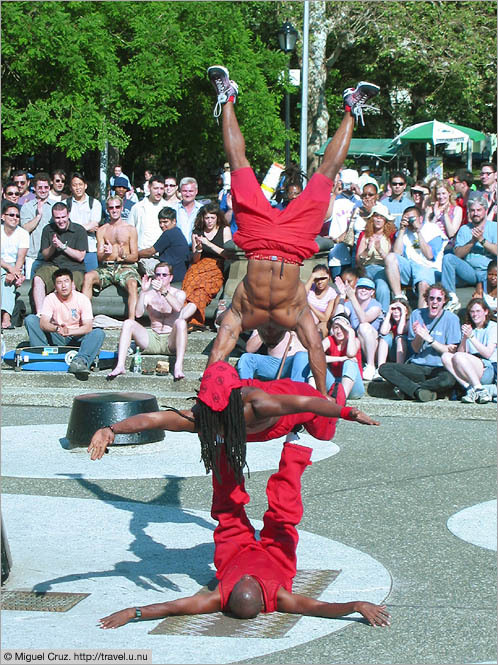 These guys, who call themselves the Calypso Tumblers, have been performing in the Washington Square Park fountain on warm afternoons since at least 1995. They fly through the air, with improbable stunts that draw gasps from even the most jaded New Yorkers. Without pads or mats, their only concession to safety is a quick look around for broken glass before they begin the show. In addition to being far more impressive performers than the many imitators their popularity has drawn to the fountain, their consistently upbeat, good-natured show chatter is a welcome break from some of the harsh, tired comedy the others use. Much of this positive spirit seems to come from Montserrat-born Alex (upside-down at the top), who gives off the impression of being about the nicest person ever to walk the streets of Manhattan.